Have you thought of building an outside bathroom? You will be surprised how many people build wonderful bathrooms in their gardens and for a good reason. The purpose of the outside bathroom is practical. It might be used for a quick shower after swimming or gardening. The outside bathroom however offers a lot more. 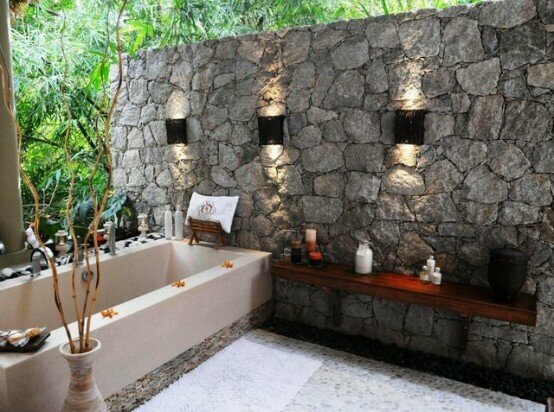 A shower or a bath in an open air bathroom is a spa-like experience. The fresh air and the beautiful surrounding offer a one-of-a-kind experience. You can decorate the small room by using different outside bathroom ideas for styles and interesting concepts. Open air bathrooms usually are small spaces that can be built from different materials. Do outside bathrooms provide privacy? Yes, they do. You can choose materials, like wood for the walls and the doors to create an intimate atmosphere and enjoy all the advantages of having shower in your garden. Among the most attractive ideas for open-air spaces are inspired by the vintage style. The bathrooms are decorated with elements of stone. Beautiful flowers and curtains complete the sophisticated atmosphere. The rustic outdoor bathrooms are very hot this summer. You will find decorations of raw wood, ceramics and glass. Create a marvelous spa-styled spot in your garden where you can unwind and relax surrounded by your favorite colors and fragrances. The open-air bathroom can become your little escape from reality. You can redesign it often if you like to keep it fresh with ideas and styles. A great idea is to choose a décor that is inspired by an exotic place you would like to visit. Outdoor bathrooms are primarily practical, but that doesn’t mean that you should just leave it with a shower and curtains under the stars. Use your favorite themes and make the best of different accessories you have around the house.